Browse: Home / 2012 / August / Mark Your Calendar! 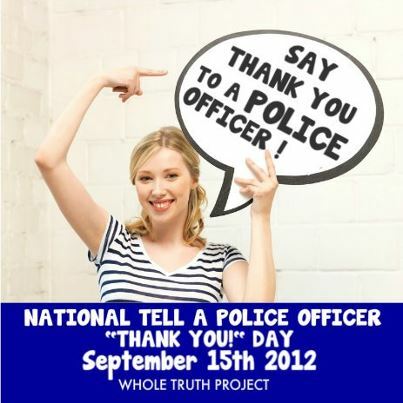 We have declared September 15th to be National Tell A Police Officer “Thank You” Day! er they may happen to run across. It’s a simple way of showing gratitude for those who serve and protect us. Now, in order for us to pull this off, we need your help. We need each of you to spread the word in your hometown. Tell your family, friends and colleagues. You can start by sharing this Facebook post with as many people as possible. We will also be looking to sign up “team captains” in as many towns and cities as possible. These team captains will help spread the word. Better yet, the team captains may be able to talk to a local business or two and see if any may donate free coffee or meals to police officers on September 15th. Those who volunteer to be team captains will receive some special goodies from us, like free t-shirts and bumper stickers. We’d love to sign up “team captains” in as many cities as possible. If you’d like to be a team captain, please send me a Facebook message or an email (ahale@ahalelaw.com) and tell me your hometown and the local police department. We may also try and distribute posters that people can use to promote this special day in their hometown. Together, we can do this. We can band together and create a tidal wave of momentum. Are you on board? We hope so. It’s going to be a lot of fun and a very special day. Start spreading the word!